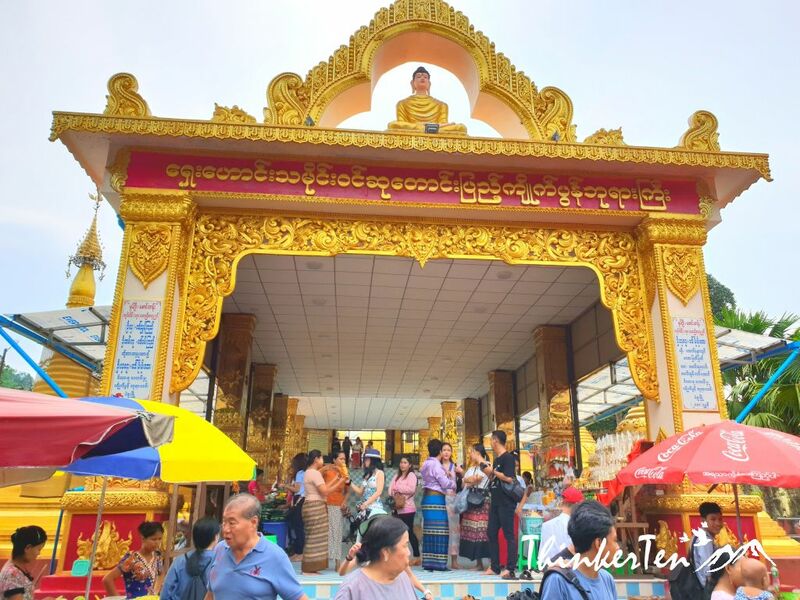 Bago is one of the historical town you cannot missed when you travel to Yangon Myanmar. Bago also known as Pegu (old name), just 2 hours drive from Yangon city. A day trip is highly recommended for anyone who wish to learn about this ancient capital city of Myanmar. 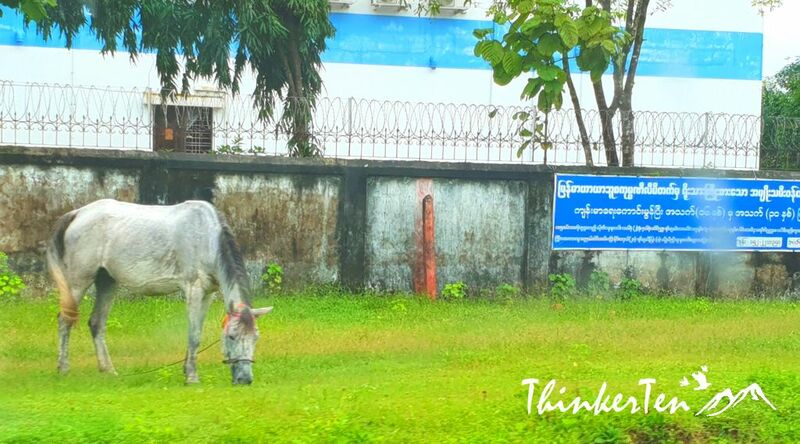 As the facilities in Bago is still very poor, you are still advised to stay in Yangon and do a day trip. 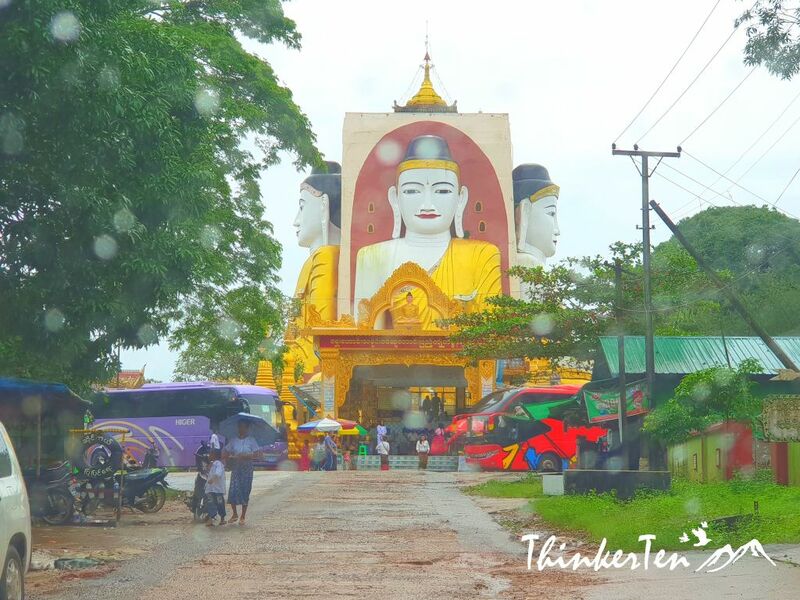 There are 4 important historical sites in Bago and one of them is Kyaik Pun Pagoda also known as the 4 seated Buddha. The 4 seated Buddhas seated in four angles, sitting back to back to four directions. It was a rainy afternoon but 4 seated Buddhas still can be seen clearly from afar. 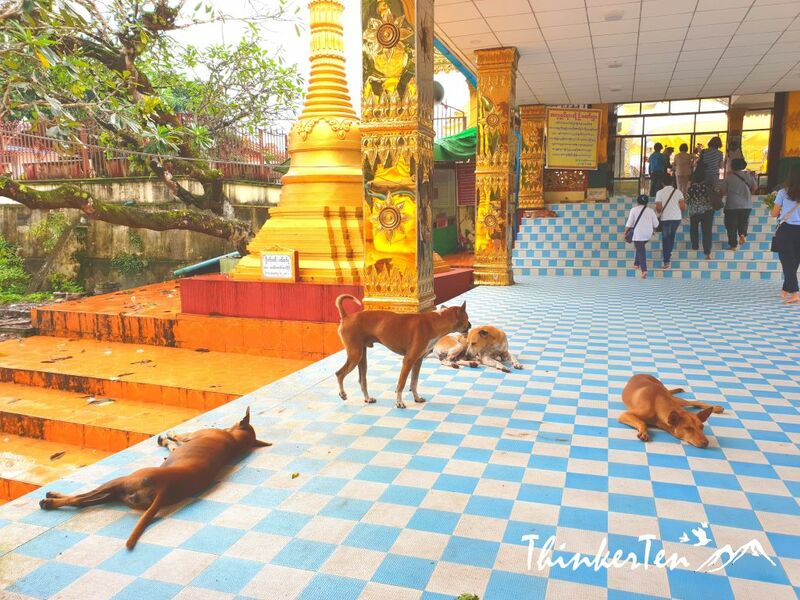 We were welcomed by a bunch of brown dogs lazing around on the hallway on the way up the pagoda temple. They look gentle and don’t get too bothered by the noisy tourists. Show your Bago archeological zone ticket 10,000 kyatt (USD 10.00) at the entrance. The small table at my left, lady in pink will ask you to show ticket and give a stamp on your ticket. Bago archeological zone ticket is a ticket for 4 sites around in Bago. 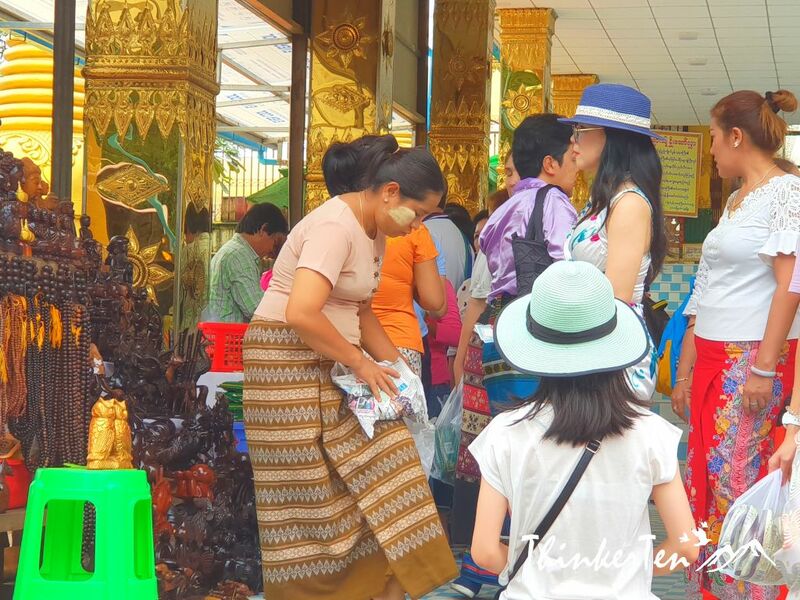 When you visit Myanmar, you notice huge tourists group coming from Thailand for religion purposes. 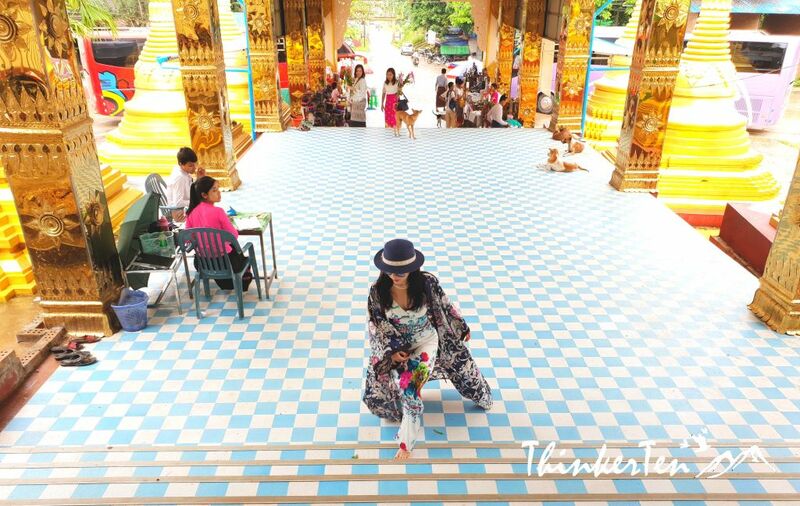 Over here in Kyaik Pun Pagoda you will witness the Thais admired their devotion to Buddhism. 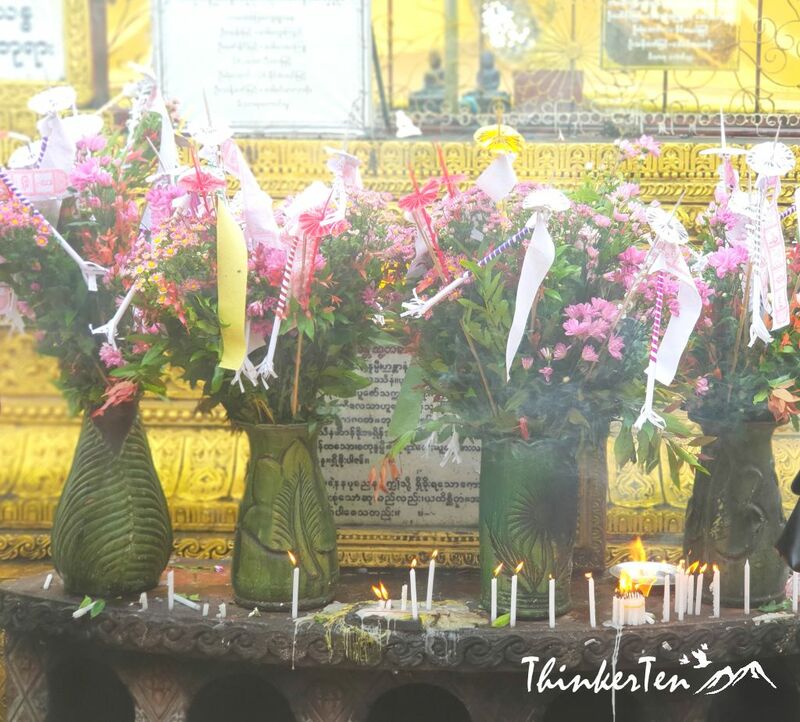 Flowers and incense sticks can be seen offered generously to the 4 Seated Buddhas. About some history for Thai and Myanmar relationship, one of the most famous King of Myanmar, King Bayintnaung who founded the Second Burmese Empire invaded Ayutthaya Thai and has strong historical connection with Thailand because King Bayintnaung also kidnapped the Thai Princess and brought her back to Bago/Pegu and stayed in Kanbawzathadi Palace. 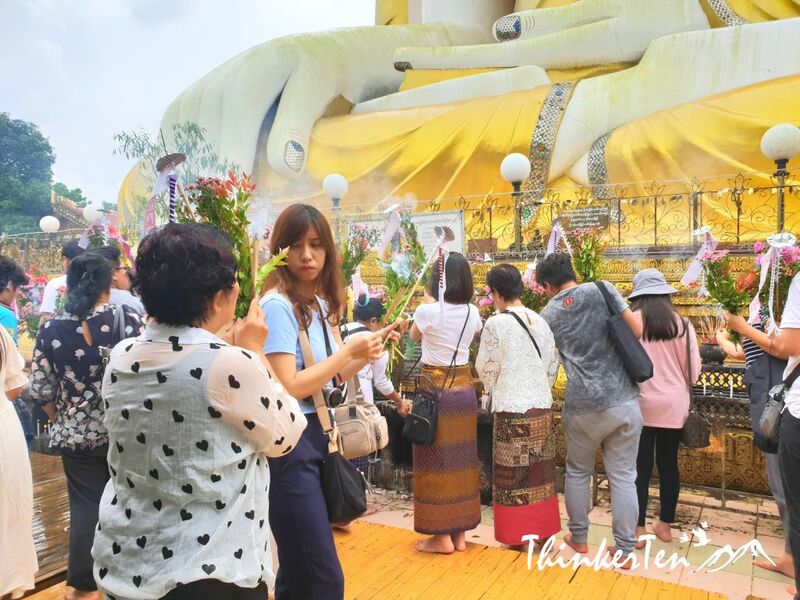 Nowadays Thai tourists love to visit Bago as they wanted to pay respect to their Thai Princess regarded as a heroine who sacrificed herself for her homeland. The 4 Buddhas look slightly different and with different expression, pay extra attention to their lips. All has its own unique shape. The 4 seated Buddha look very big when you go near, it is as high as 6 floor houses. It was originally built by King Migadippa of Bago in the 7th Century AD. The best picture shot you can take is from a corner catching two Buddha at a time. The space near the 4 Seated Buddha aren’t that spacious. 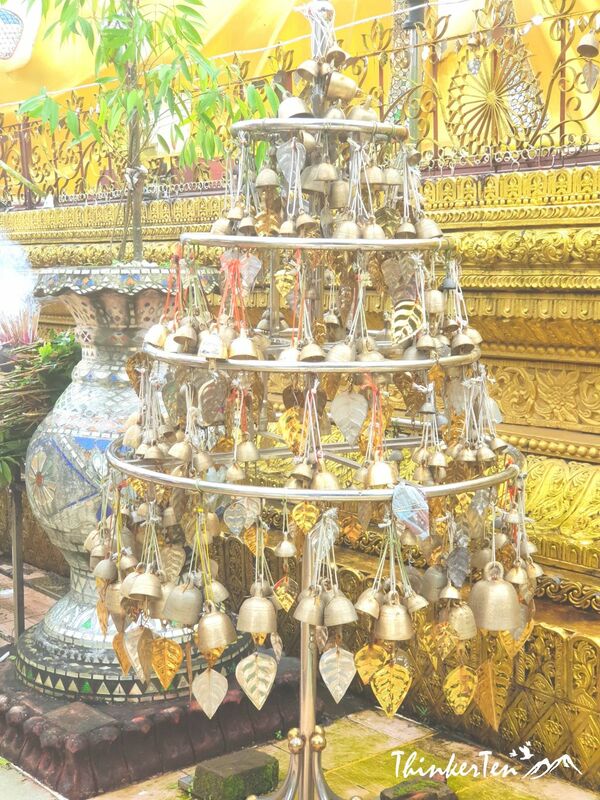 You are able to see the affection of bells in Myanmar, especially in the temple pagoda. Dozens of little bells hanging around in the temple complex. Smaller bells usually hang together and a huge bell would stand alone. At the entrance, there are souvenirs that you can buy back. Many woodcraft souvenirs can be found and I have chosen a pair of owls. Owls in Myanmar meant to bring in good luck, just like the Japanese maneki neko, the cat. Owl in Myanmar are called Zee Kwet in Burmese and usually in pair, male and female. People place the owls outside the house to protect the family. Thanaka is the yellow powder applied in most Burmese ladies and children’s faces. It is said the natural ingredient from the barks of the tree have the chilling effect for hot and humid weather. 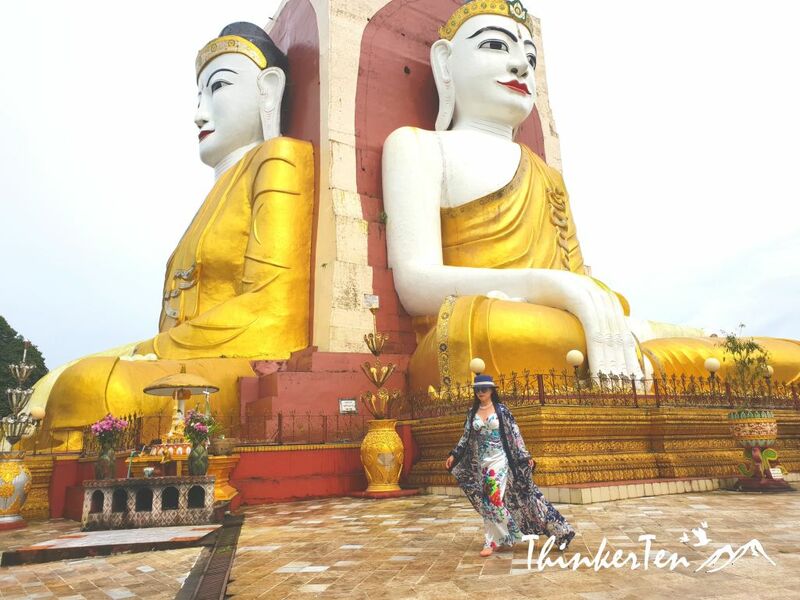 Half an hour is good enough to explore the 4 Seated Buddhas – Kyaik Pun Pagoda. All 4 Buddhas look slightly different with different expression, pay extra attention to their lips. Like the rest of temple complexes in Myanmar, the attire is no sleeveless, no shoes, no socks and knee-length pant and skirts. 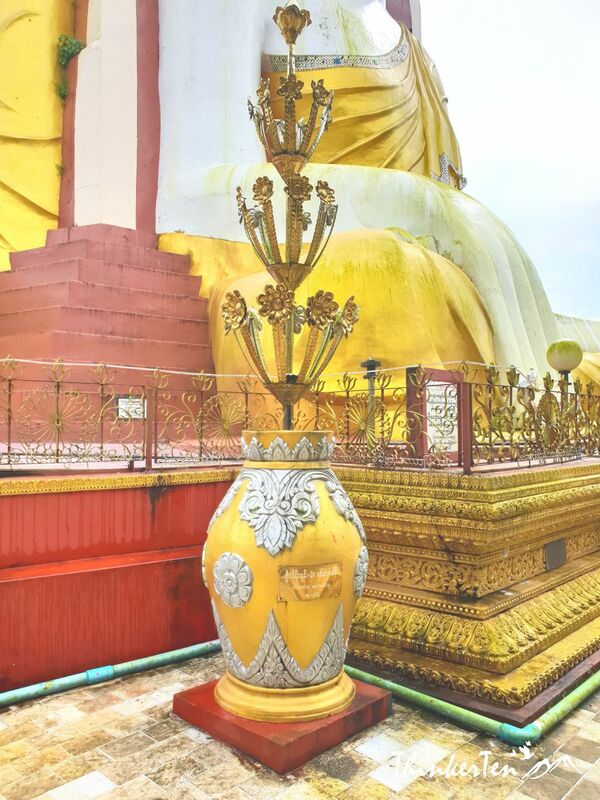 The 4 seated Buddha and the affection of bells in the Myanmar temple pagoda sound glorious. I need to put this on my list of places to visit. This is one of the must visit site in Bago city. It huge and grand. That place looks so amazing! thanks to you, Myanmar has just shot to the top of my travel bucket list. the place looks interesting! I would love to see with my own eyes as you recommend it! Yes, experience it yourself is the best to discover this place. What a beautiful place. Your photographs are amazing and I love all of those tidbits of history! Glad you like those pictures. It is hard to shoot pictures with the 4 seated buddha as they are quite huge and sitting back to back. The best angle is taking two at a corner. I am always into discovering new places and these photos are awesome! I’d love to visit. Wow this place is so beautiful! I’m sure the pictures do not do it justice:) How amazing to see it in person! Hopefully I can visit here someday! It is really awesome to see it yourself. Omg what a neat place to explore! I would love to visit one day! This is a stunning place to visit! I’ve not yet been to Myanmar, but I appreciate the tips; they’ll come in handy when I do visit. Myanmar is not as developed as other countries in Southeast Asia such as Thailand and Vietnam. However, it has plenty of temple pagodas and friendly people in this beautiful country.